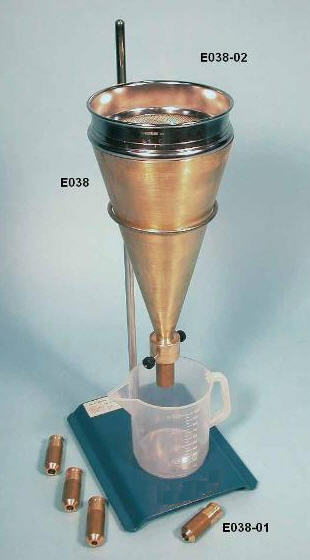 Used for viscosity and fluidity determinations of mortars, muds, grouts, fluid materials, etc. Mortar fluidity is considered suitable when the flow time of 1000 cc of mortar is comprised between 17 to 25 seconds. Entirely brass made, it is supplied complete with four interchangeable nozzles dia. 8 -9 -10 -11 mm, stand adjustable in height, plastic graduated cup. Cone top dia. is 155 mm, total length 290 mm, capacity 1700 cc.